Over 25 years the adventure-cruise ship TRUE NORTH has developed one of Australia’s most revered holiday reputations. Offering activity-based itineraries all around the Australian coastline and adjacent to the remote jungles of West Papua and Papua New Guinea, the TRUE NORTH has become a firm favourite with Australia’s travelling elite. Even today, most of the guests onboard the TRUE NORTH are well-qualified Australian adventurers lapping-up the personal attention of the ship’s enthusiastic and also very Australian crew. But the appeal of this gleaming adventure-platform complete with helicopter and multiple expedition Boatswas always bound to attract the attention of discerning overseas travelers and, according to North Star Cruises’ general manager, Peter Trembath, the tide has begun to turn! And the company’s efforts to lure well-heeled overseas guests will not be harmed by the appearance of current celebrity guest Jerry Hall. 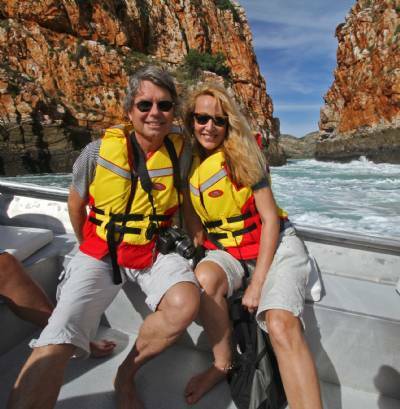 The well-know actress and model joined a Kimberley cruise earlier this week and is already raving about the experience. Ms Hall is travelling with her partner, Perth millionaire Warwick Hensley, and is on assignment for the London Times. She will report on her travels when she returns home and the likely front page exposure will hopefully be a major bonus for all tourism operators in the Kimberley.